A peculiar aspect of this hobby is the appearance of sets with no apparent manufacturer or labels. Most seem to originate from Eastern Europe or Asia, and one that is still being sold is this example. The set contains eight poses, and comes in a small box that is unmarked apart from a stuck-on label showing a photo of a group of Nazis. 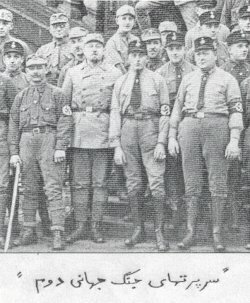 The writing below this picture is apparently Persian and translates as 'Leaders of the Second World War', although some dealers have alternative translations such as 'World War II German Party Leaders'. Both titles are surprising when the figures themselves are examined. This list should be taken as merely suggestions as there is no definitive identification available. Most of the named figures could also be simply general officers, or other named individuals. The 'Rommel' seems to hold a baton, marking him as a Fieldmarshall, and the 'Himmler' figure could be almost any German army officer. The female auxiliary wears a uniform that was very common, and she could just as easily be in the army or police as a party worker. The 'Churchill' figure is simply a civilian, and the cane that he carries conveys more than a suggestion of Charlie Chaplin! Assuming these identifications, the name of the set is strange indeed. Both Mussolini and Churchill would have been surprised to have been labelled as leaders of the Nazi party, and the female auxiliary can hardly be seen as either a Party or National leader. The figures seem to come from the same stable as those of LW and other Eastern European manufacturers, and have much the same characteristics. The figures are extremely flat, and although there is a fair amount of detail it is very shallow and often difficult to distinguish. To make matters worse the figures come in black and a semi-transparent silver colour as well as the illustrated tan, making them even harder to make out. Flash is plentiful too, and some have very small bases which are barely adequate. Even the poses are less than great. The 'Himmler' figure has a poor approximation of the Nazi salute, and why would 'Rommel' hold his baton like that? The argument goes that it is better to have poor figures than no figures, and there is some truth in that. Most of these subjects are unique to this set, and a skilled painter would be able to make more of them than did the sculptor. However for the majority of people this set, whatever it is actually called, is little more than a curiosity, and not worth adding to the collection unless you absolutely must have everything ever made.